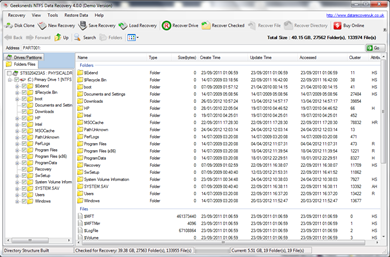 Geeksnerds NTFS data restore utility is equipped with four types of scans in order to recover lost, corrupt, formatted and deleted files or folders: Normal, Advanced, Formatted and Deleted scans. NTFS data recovery software has two modes of scanning NTFS file systems for recovering lost or corrupt partitions: Standard and Advanced scans. If you are not sure about the partition or file system details, then it is recommended that you should try “Raw File Recovery”. Select the drive from which you want to recover data and then select 'Find Partition' option from the toolbar or 'Scan Partition' option from the context menu of partition/drive to run the partition scan. Follow the instruction given by the partition wizard to retrieve partition. On completion of the scanning process, tree of lost files and folders will be created. Lost files or folders will be marked with red color. Select the 'Recover Drive' from toolbar or select the files and folders that need to be recovered and then you can select the 'Recover Checked' from toolbar or from the context menu. Geeksnerds NTFS Data Recovery will show progress of saving the recoverable data. If you are unable to recover data by using our Geeksnerds NTFS Recovery Software then you may require "In Lab Data Recovery Services". For "In Lab Data Recovery Service", call us or submit your case online. 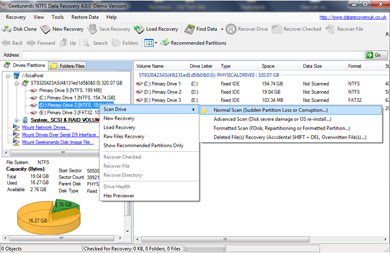 Click here to go to NTFS Recovery Software Homepage. One morning when I woke up I was shocked to see that my hard disk had been crashed and all important data had vanished. I didn’t have any idea whom to contact in this critical situation. I talked to my friend and he gave me their number and I contacted them with no hope of recovery of my data. I don’t know how they did it but all my important data was recovered in a matter of two days. Thank you Geeksnerds for fixing my hard disk. Copyright © 2016 Geeksnerds Limited.